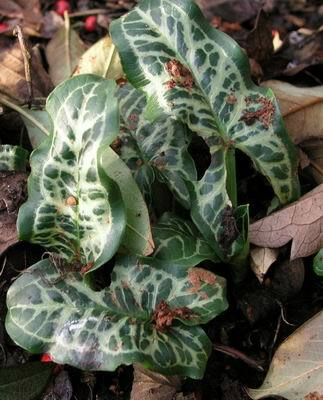 The wonderfully marked foliage of Arum italicum var marmoratum is still a welcome sight even if it is a bit chewed and covered in bird droppings (good fertiliser). This clump is below one of the cotoneaster trees which attract many interesting birds into our garden. 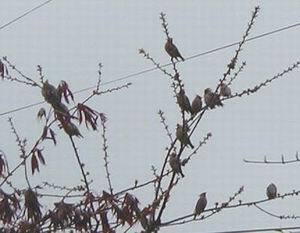 Not the best picture in the world but it gives you a glimpse of these wonderful garrulous and colourful birds. 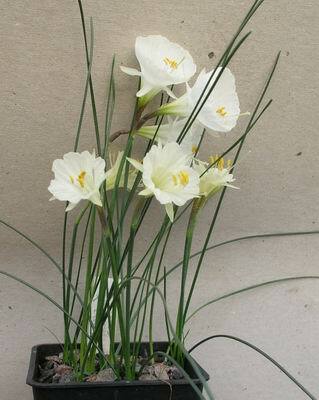 The sharp eyed amongst you will immediately spot that there are two different narcissus sharing this pot. This sort of accidental mix-up happens to even the most careful of growers from time to time. I know there are lots of ways recommended to mark the different forms with string , labels, etc. so you can separate them out when you come to re-pot but I can tell you from experience that these methods are less than efficient. There are only two ways to sort this out, one is when you re-pot, plant each bulb individually into its own pot - this takes up a lot of time and room. The best way is to carefully tip them out and sort them now while they are in flower. Do this when the plant is due to be watered which means that the compost will not be too wet and should fall away from the delicate roots without any difficulty. 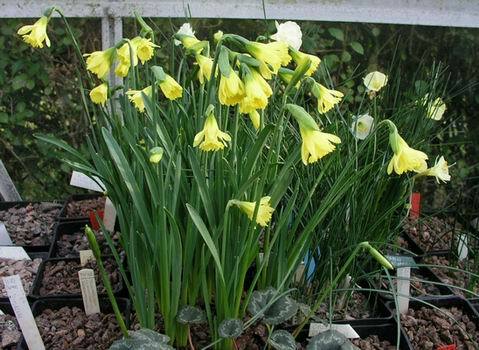 Sort out the flowering bulbs and repot them by type - non-flowering bulbs are a problem and may be best planted into a third pot or, as in this case, you can take an educated guess and hope that you have made the correct choice. 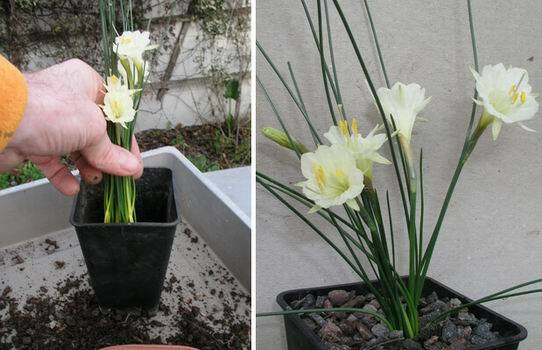 Carefully repot your bulbs to at least the same depth in the pots, label them and then give them a good watering in. Never put off writing labels for pots or on seed packets thinking that you will remember and do it later, this is a big mistake, if you are like me you invariably forget. 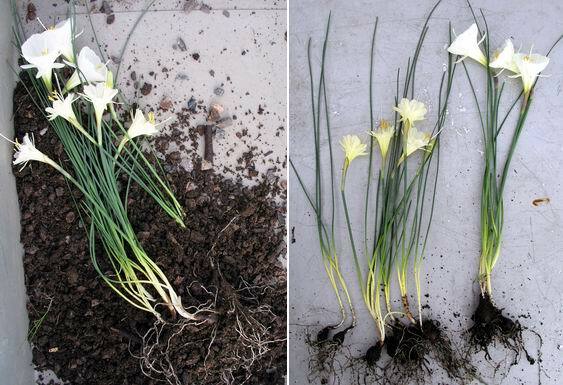 I present this picture to show the variation that occurs within Narcissus romieuxii. 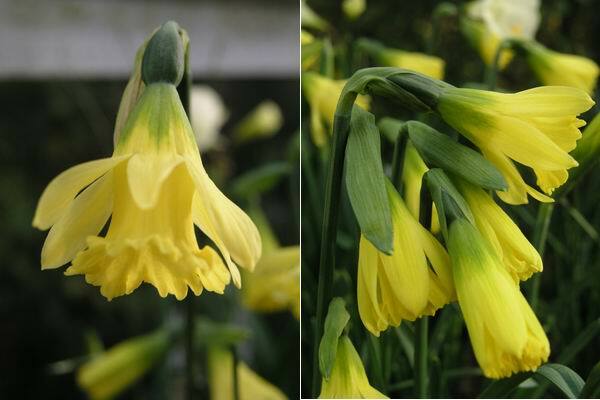 The yellow flower on the left is just un-folding and the kinks in the petticoat will sort them selves out as the flower gradually expands - these flowers although open continue to grow for some weeks before they reach their full size. The large flowered white form on the right is a self sown seedling flowering in the sand plunge - possibly a 'Camoro' seedling. 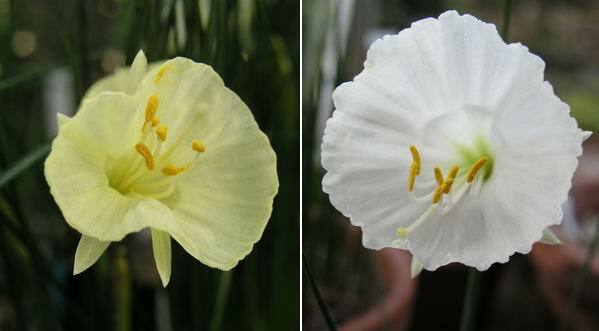 Another narcissus flowering in the plunge just now has a much smaller flower on a shorter stem (7cms) but as you can see has another two buds coming from the same bulb. I have to admit that I enjoy these bulbs that seed themselves into the sand plunge and often let seed fall into the plunge intentionally. 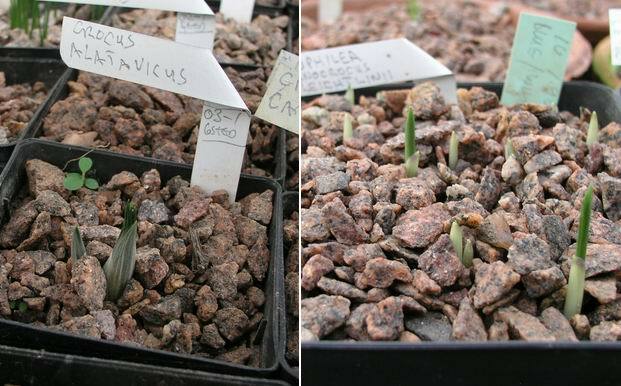 Elsewhere in the glass houses many other spring flowering bulbs are showing through the gravel like this Crocus alatavicus and a pot of tecophilea. If the weather turns cold they will sit like this for some months before they put out their flowers. 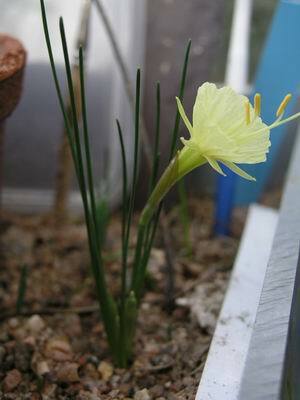 Narcissus 'Cedric Morris' is in flower earlier than it has ever been for us. Because it flowers so early while day light hours are at their shortest and light levels at their lowest it always grows taller than I would like but this does not take away the great pleasure we can get from this beautiful flower that continually reminds us that spring is not that far away. 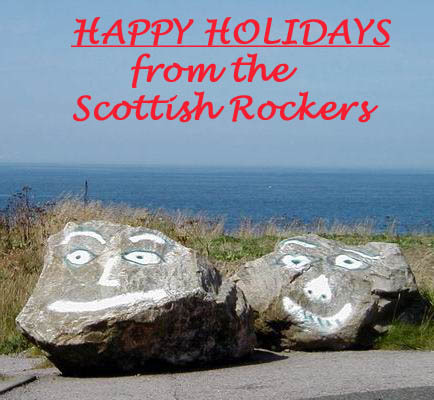 As the last log for 2003 will not appear until after Christmas I will leave you this week with a mid winter greeting from Aberdeen.